This rather obscure request had me thinking of scenarios where it would be useful to change the last user name in Windows. Imagine you’re a network admin and you want to do some work on the PC as the domain or local administrator. 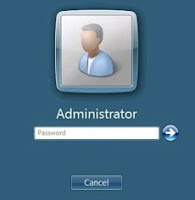 When you finish and log out (assuming the last user name display is enabled), the login screen will display “administrator” or “domain\administrator”, forcing the previous user to type in a user name or use the “Switch User” button. What if, when done working on a computer as an administrator, you could set the username back to the previously logged in name and make things easier on your users? I’ll show you a few ways you might do this. 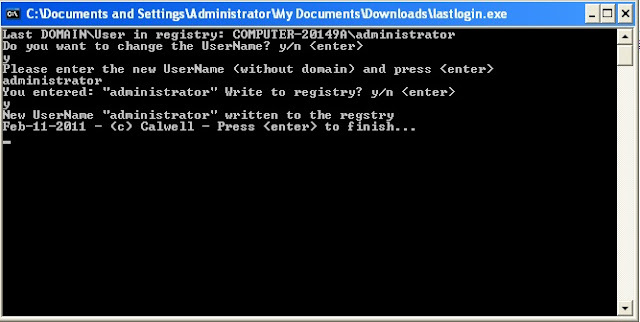 In Windows 7, it’s a little more tricky, you need to run the Registry Editor as administrator and find the above key. The trouble is, by default, users don’t have access to this key. So, you’ll have to run regedit as administrator to get at it. Place it in a location you can access like your server and modify the file to the correct user just after you login as administrator on that computer. Once your finished, run the lastlogin.reg file, add the details to the registry and log out. Done. As a matter of interest, you can always hide the last user name. So, to bring it all together, I decided to make a small tool that would do most of the heavy lifting here. Certainly, that’s not what we need, so lastlogin would then need to be compiled on a 64bit machine (worth testing?). 2. Another interesting approach is to hide your administrative account from the login screen altogether. Doing this will allow someone to see the name of the account by looking in the registry, but it’s not a bad utility idea. Then, create a new DWORD (32-bit) Value and change the name to your administrative account (with domain, such as DOMAINusername), and keep the value at 0 to hide. You can download this free Windows tool, lastlogin, here.